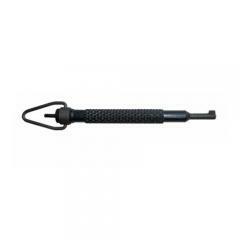 Having a handcuff key at the ready is never a bad idea, whether it's a spare or a skeleton, and Zak Tools's Round Swivel Handcuff Key Polymer is a tough and convenient choice. Zak Tools uses stainless steel to construct these keys and adds a heat treatment so it is durable and made to last - so much so that it comes with a lifetime guarantee. The key features a round polymer body and a swivel top for ease of movement even while attached to a key ring or strap. The swiveling round handcuff key is universal to work with any standard model of handcuffs so you don't need to have multiple versions for different cuffs. These Zak keys are manufactured in the USA. Makes life alot easyer when cuffing instead of dealing with smaller cuff keys.